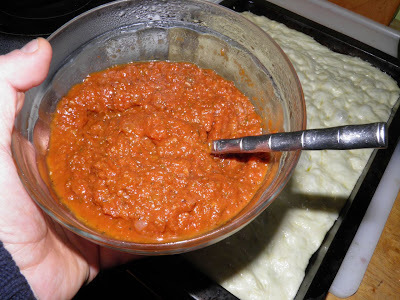 Enough sauce for a 13x19 pizza, that easily makes six good sized squares. If you're like us though, it's a pizza for two! 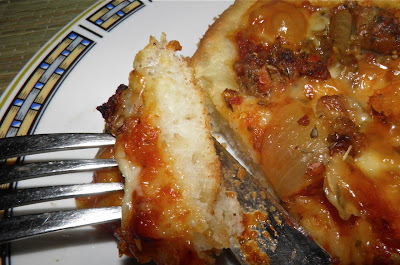 On Monday I posted about a snowstorm-stuck-at-home all-day rise pizza crust (here). 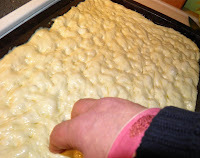 I had nothing better to do, being somewhat storm stayed, so I decided to take the time to see what autolysing pizza dough would do. Quite a lot actually, as it turns out. It was very light and fluffy. One of my best crusts. I would have posted this recipe sooner but it seems that the world would not let me. Between Monday and today I posted about moving and leaving work, a friend's birthday, and Shrove Tuesday pancakes. Quite a full week. I've made sauces in the past, but never one this easy. The whole process took about 30 minutes from start to finish. That's not bad. It also uses nothing out of the ordinary for ingredients. One might even say it uses what you can find in your pantry. All combined and ready to cook down. With a simple can of tomatoes (No Name), some wine and other things I was able to make a pizza sauce that was flavourful and thick. 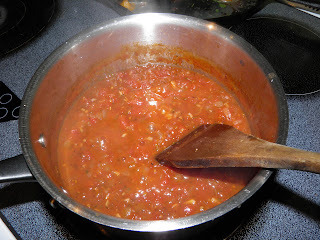 This sort of amazed me because many homemade tomato sauces – as well as store-bought – are watery. It's not the most pleasant thing when you use them. Some are even more expensive sauces. I've listed this as a pizza sauce, but it would just as easily be able to be used with pasta. 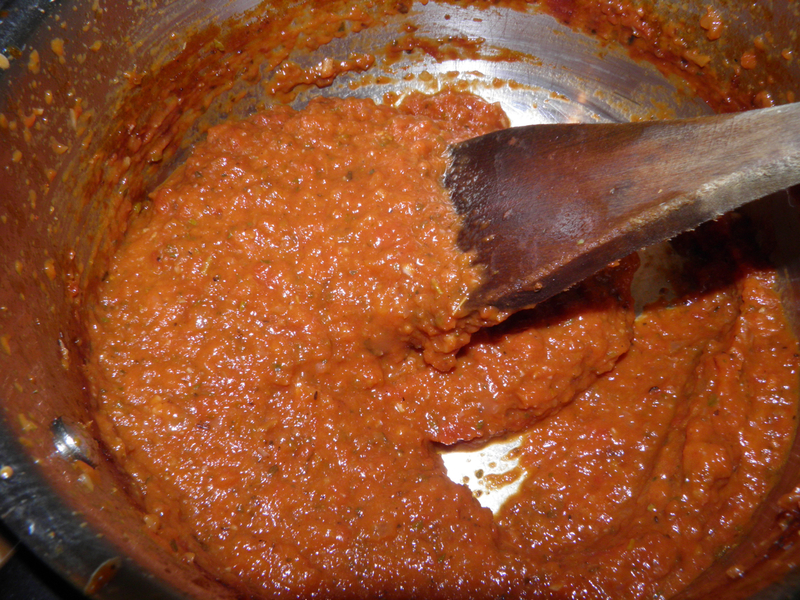 You could also make variations of this sauce very easily. For example, substitute basil for the oregano, or a combination. Double the chilli flakes, add olives and capers… you name it. You could also cook it down and then add cream. Mmmm, cream…. You can also multiply this recipe and "can" it. Just put up on sterile jars and water bath process for 10 minutes to seal. That way you can have homemade sauce any time you want. The pizza itself used up some leftovers too. I thawed out some sun-dried tomato sausage that I had made a few months ago (recipe on this blog). I pan fried it with some onion and sweet pepper and then topped the pizza with herbs and mozzarella. All in all, a nice comforting dinner to have on a snowy day. I understand according to the weather station we're in for a bit more white stuff on Sunday. Maybe even Mother Nature is telling you to make homemade pizza crust and sauce this weekend! This is the sauce cooked down and puréed. Heat the oil in a saucepan. Add the onion and garlic and sauté on medium low until the onions are translucent. Crush the tomatoes in their liquid with your hands, just to slightly break them up. Add to the pot. Let the mixture bubble, stirring occasionally. Cook until fairly dry and the bottom of the pan stays clean when you pull a spatula through. Take a stick blender (food processor or regular blender) and purée until smooth. Taste and add salt.